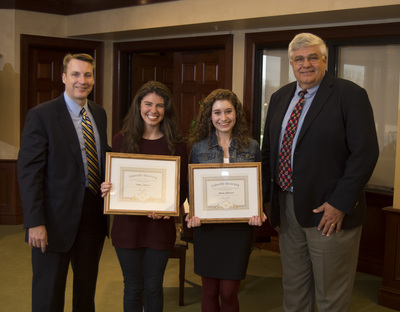 Cedarville President Thomas White, left, stands with SBACS Scholarship recipients Rachel Williams from High Point Christian Academy, and Victoria Stearns from Naples, FL, and Ed Gamble from the Southern Baptist Association of Christian Schools. Cedarville University’s School of Education and the Southern Baptist Association of Christian Schools (SBACS) are partnering to bridge the gap between Christian education in K-12 schools and higher education. As a result of the partnership, two qualified students will receive full tuition scholarships from Cedarville University. Cedarville University, "Cedarville’s Partnership with SBACS “bridges gap” in Christian Education" (2014). News Releases. 47.